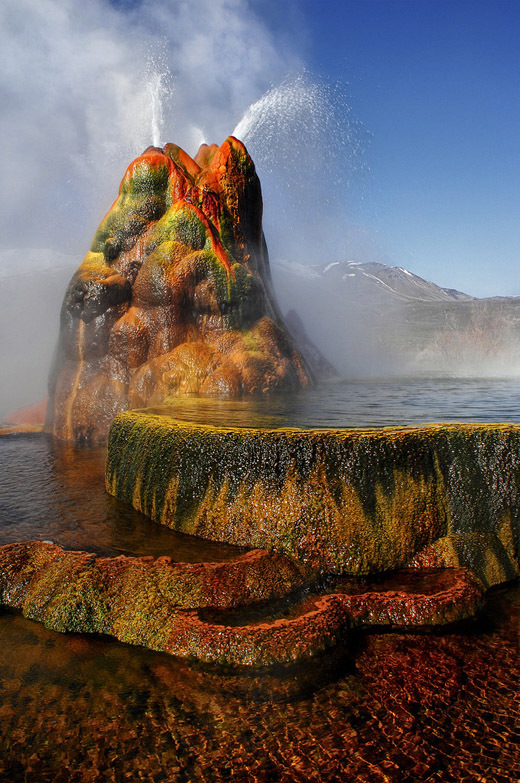 Fly Geyser is a small, 1.5 m high geothermal geyser that is located near the edge of Fly Reservoir, Nevada. The Geyser was accidentally created in 1916 during the drilling of a well when a shaft was drilled in hopes of striking water to turn part of the surrounding desert area into farmland. The well functioned normally for several decades, but then in the 1960s geothermally heated water found a weak spot in the wall and began escaping to the surface, turning the area into a desert wetland. Dissolved minerals started rising and piling up, creating the mount on which the geyser now sits. Today, water is constantly squirting out reaching 1.5 m in the air. The geyser contains several terraces discharging water into 30 to 40 pools over an area of 74 acres. The geyser is made up of a series of different minerals, which gives it its beautiful colors. Recently, yet another new geyser has formed. For unknown reasons, the original geyser has gone dormant. One hypothesis explaining this is that later geysers robbed the original of its water supply. Fly Geyser is a secret tourist attraction located about 200 km north of Reno, Nevada. 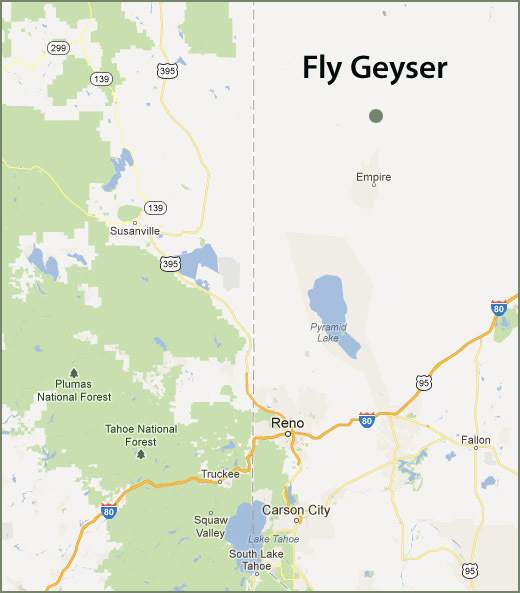 The Geyser is located in Hualapai Flat, about 0.5 km from State Route 34. It is large enough to be seen from the road. Fly Geyser is located on the privately-owned Fly Ranch and is accessible only by a small dirt road. No quiz this week due to summer vacation!